Agatha Christie was called �The Queen of Crime�, a title that she certainly deserved. In her more then fifty years of writing she produced some of the most intriguing and �well I never thought the murderer was them� detective stories. She was the Queen of the literary three-card-trick. She would create a mystery, lead you down a path thinking a certain character is the murderer and at the end pull the rug from under your feet with the murderer as a totally different character � the last character you would suspect. Reading one of her books is like playing a game against her, can you spot the murder before she reveals them. The critism can be levelled against many of her books, and not unfairly, that they are comfy and re-assuring. There is a murder, often more then one, but by the end, order has been restored and the good can live happily ever after. But this is not the case with all her books, especially in her finest ones. 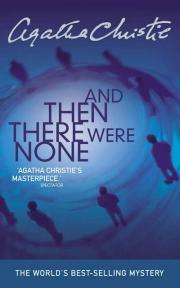 And Then There Were None is one of her finest novels, if not her finest. The plot is simple, but in it�s simplicity lies the genius of this novel. Ten people are invited to a mansion, on an island off the Devon coast, ten people all with a personal secret. Once on this island, they find their host, the strange Mr Owen, fails to appear. After dinner, on the instruction left by the mysterious Mr Owen, a record is played which accuses everyone there of causing another person�s death, through neglect, incompetence, cruelty, greed or prejudice � though none of them are �murders�. Then, one by one, the ten people begin to die, murdered following the lines of the children�s poem Ten Little Indians. To begin with this does have the feeling of other Agatha Christie novels, light in mood with the expectation that the murder will be unmasked and all will be returned to normal, but this doesn�t happen. More characters die and the tone gets darker and darker as fear grips the surviving characters. At first the characters believe the murder is an outsider, not one of them, hiding somewhere on the island. Then the realisation comes that one of them is the killer, with that comes the real fear. This novel has been filmed many times, so original is its premise, but all of them follow the stage play version, not the novel, and have a far brighter and upbeat ending. The novel has all ten characters die on the island, before the murderer is unmasked. Only, at the very end of the novel, when the murder�s confession is finally found, is the mystery revealed. This is by far Agatha Christie�s darkest novel, with a very original premise. A tense psychological thriller with a real feeling of cat and mouse about it. It has all her stock-in-trade favourite characters (the old maid, the doctor, the major, the servants who see too much, the attractive young couple) yet here she puts them in a very dangerous situation that pushes them out of the realm of arcitipes and into real characters living a dangerous game. If you have only ever seen one of the film versions of this novel, try the novel because you will find it very different and gripping. If you have only known Agatha Christie through her Miss Marple and Poirot stories, then try this novel for a far darker read. If you are an Agatha Christie fan, sit back and enjoy her at her best.